Just after arriving in a foreign country a man is in a car accident that knocks him into a coma. Days later after he awakens, the man finds out that someone has stolen his identity and no one believes him. His own wife reacts like she has never seen him before. With no other options the man sets out to uncover his true identity and prove who he really is. "Unknown" is the worst kind of mystery because it reveals itself too early on. While the plot of the film and characters within it are still questioning the mystery and working towards a resolution, the audience has already been given enough clues to know where the 113 minute thriller is going. From there the film never regains any sense of tension or mystery leaving the viewers anything but engaged and ultimately just waiting for the ending to come. I'm a big fan of stolen identity or mystery thrillers but they have to keep you guessing and "Unknown" certainly does not. Liam Neeson per usual is good in the lead performance. Trouble is you spend the whole movie wanting more from his character. You've seen him previously in tougher roles and it is very easy to be disappointed by his role here. I have heard a number of "Taken" references prior to seeing the film and unfortunately those claims hold no water. The only remote similarities are Neeson, a foreign setting and that he is tracking in both films. The big differences are plain as day. 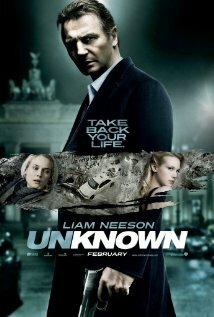 'Taken' is a no holds barred action, while 'Unknown' is trying its best to be a mystery. 'Taken' also houses a true badass who knows who he is, while in "Unknown," were stuck with a confused individual stumbling along until the end of the movie. All that said, Neeson is present in the film and the driving force. Without his performance the film would ultimately be a huge waste of time and just another stolen identity re-tread. January Jones is awful. She plays Elisabeth Harris, Martin Harris' wife. Jones comes across stale throughout leaving nothing other than a pretty figure on screen. Her scenes opposite Liam Neeson feel terribly forced and leave Neeson looking like he's acting with a standee cardboard cut-out. While talking bad performances, I might as well mention Frank Langella. I should clarify, its not that Langella is actually terrible like Jones is, he however gives a phoned in performance. He is a throwaway character in a mystery filled with pointless people that are outlined to be role players. Langella seemed to recognize this and just gave a very unmemorable performance. One that was probably shot in a day or two with very little struggle for the veteran thespian. On a positive note, Diane Kruger is a nice counterpart to Liam Neeson as they uncover the mystery behind Martin Harris' identity. Having a man and a woman linked together in a mystery one of the oldest tricks in the book, but here in "Unknown" the combination of Kruger and Neeson was welcomed. Although, you can't feel too bad for the the main character when he goes from a gorgeous but stale woman to a gorgeous and enthralling woman through the course of the so-called thriller. The biggest gripe with "Unknown" is the lack of intensity. Over the course of the film I wanted more to every aspect or had seen it better previously. The film sadly just subtly trolls along. The risks are never tough enough, the stakes are hardly ever raised leaving no thrill or intrigue. Actually the intrigue is there, but it is wiped away and lost amongst all the slow paced discovery. Even technically the film just feels to be lacking. Some of the editing choices throughout the action sequences lose the focus of the scene or give us a less than moving experience. There are multiple big action pieces that could have been white knuckle thrill rides, but instead come across as over edited carbon copies of other action sequences we've seen previously. Even the explosions feel lackluster. There are a few big explosions that are all CGI and just comes across as, well CGI. Like everything else, they leave something to be desired. "Unknown" is a less than enjoyable thriller. It fails at becoming exciting in any capacity and loses the viewer early on by revealing too may obvious indicators of the mystery. The pace stumbles along and never seems to get into full gear until the final 10 minutes of the film. Oddly enough, if director Jaume Collet-Serra would have given us more of what we have in the final 10 minutes of the film, it might have been a much better thriller. Final word, wait for the home viewing experience or just re-watch 'The Bourne Identity' trilogy.